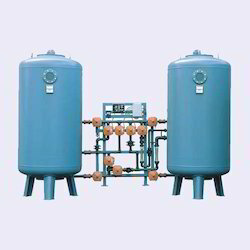 Prominent & Leading Manufacturer from New Delhi, we offer water softeners and water softening plants. Owing to its uncompromised quality and market leading price, these Water Softeners are quite preferred in the market. Their easy installation, operation and maintenance make them a product, which is highly user friendly. Manufactured in compliance with the industrial standards, the offered products are used for removing the hardness of water to make it usable. We are able to gain immense expertise in delivering Water Softening Plants at clients premises. The offered range of water softening plants is available in different customized specifications and forms as per the diverse requirements of valued clients. Along with this, the offered range is available with touch or S coda monitoring screen, which ensures clear display. Offered range is designed using ion exchange technique, which is a procedure of dealing undesirable ions with much more desirable ions ensuring the softness and eco-friendliness of the water. Looking for Water Softeners ?